Briefly a political superstar after engineering the 1994 Republican takeover of the House, Newt Gingrich and his colorful "big ideas" faded from the national scene for nearly all but the Fox News faithful after he left Congress in 1998, following GOP midterm-election losses that many blamed on his zealous pursuit of Bill Clinton's impeachment. (It later emerged that Gingrich had been having an affair of his own  one of two to which he's confessed.) Now he's considering a comeback with a potential 2012 White House run. 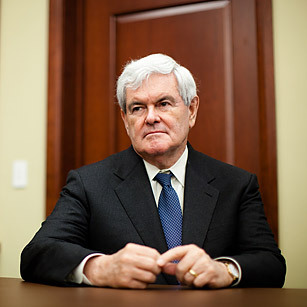 Polls may show that Gingrich is among America's most disliked politicians, but in an uncertain Republican field, the tart-tongued former Speaker of the House  who warns against President Obama's "secular, socialist" policies  stands a chance at the nomination.